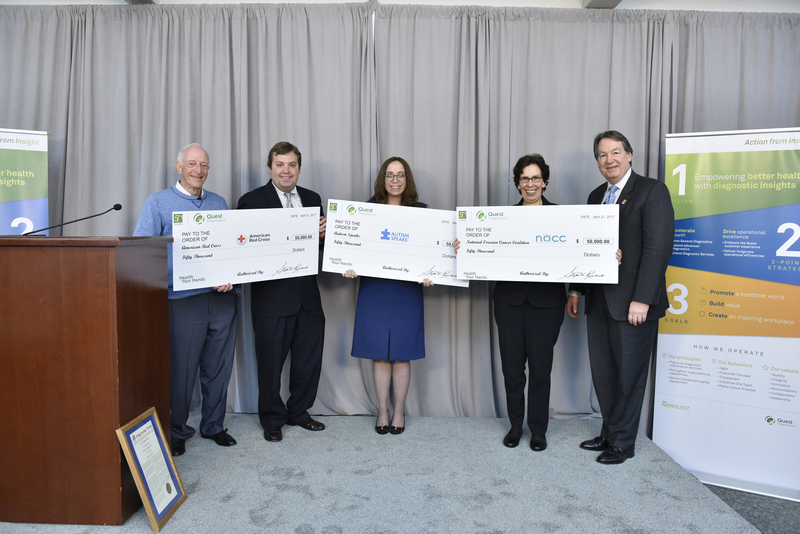 MADISON, N.J., April 24, 2017 /PRNewswire/ -- Quest Diagnostics (NYSE: DGX), the world's leading provider of diagnostic information services, commemorated its 50-year anniversary by awarding $150,000 in total grants to three organizations that share its goal to improve healthcare: The American Red Cross, the National Ovarian Cancer Coalition and Autism Speaks. At a ceremony at the company's flagship clinical laboratory in Teterboro, NJ, the company's chairman, president and CEO Steve Rusckowski presented Health In Your Hands grants of $50,000 to representatives from each organization. Paul Brown, M.D., founder and former CEO of Quest's predecessor company Metropolitan Pathology Laboratory, Inc. or MetPath, established in April, 1967, was also recognized at the event. "Fifty years ago this month, Paul Brown began our company with the simple idea of finding a better way to deliver diagnostic insights that can empower better health. 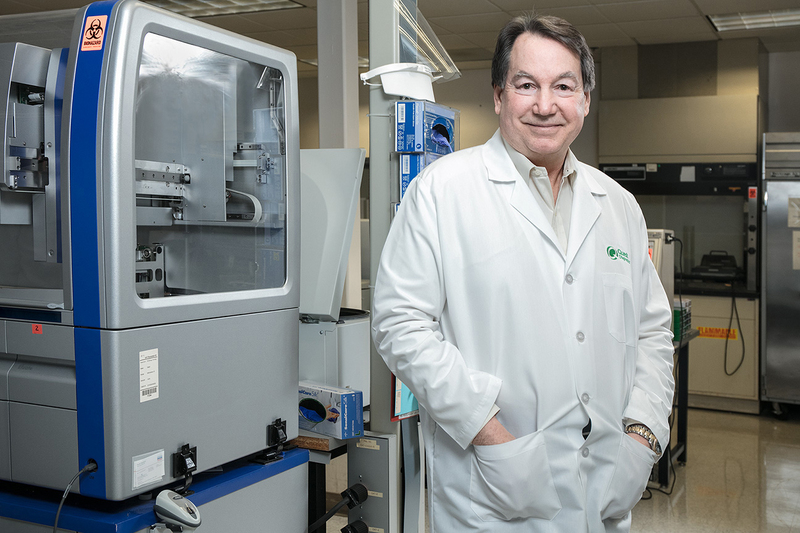 From this concept, Quest Diagnostics has evolved to be the leading provider of diagnostic information services, whose expertise, innovations, scale and speed have been at the center of the U.S. healthcare system for the past half-century," said Mr. Rusckowski. "Our 43,000 employees are dedicated to meeting the coming challenges in healthcare and making this a healthier world." 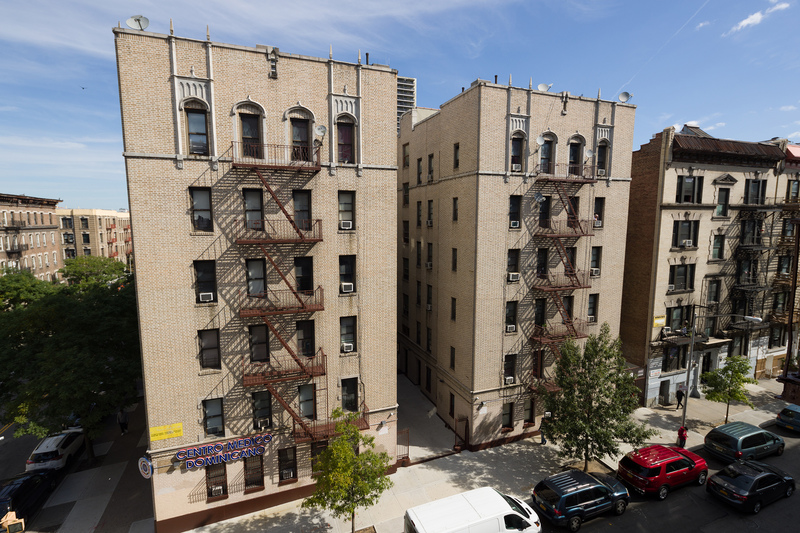 Quest Diagnostics was founded in April 1967 as Metropolitan Pathology Laboratory, Inc. (MetPath) in a two-bedroom apartment in Manhattan to provide better lab testing to area hospitals. Corning Glass Works acquired the company in 1982, grew the business through hundreds of acquisitions and later spun it off as a publicly traded company under the name Quest Diagnostics, at the beginning of 1997. Over the span of 50 years, Quest has developed countless innovative diagnostic information services, with several firsts for clinical laboratory tests in areas such as women's health, genetics, infectious diseases and cancer. Last year, the company was the first commercial laboratory to receive U.S. Food and Drug Administration emergency use authorization for a molecular Zika test. Today, Quest provides thousands of laboratory services, from genetic tests to predict cancer risk to biological tests for diabetes and heart disease, to empower people to take action to improve health outcomes. Derived from the world's largest database of clinical lab results, the company's diagnostic insights reveal new avenues to identify and treat disease, inspire healthy behaviors and improve healthcare management. One in three American adults and one in two physicians and hospitals use the company's services each year. Quest is recognized as a leading company by organizations and publications, such as Fortune, Barron's, the Dow Jones Sustainability Index and others. The company is the only diagnostic information services provider ranked among Forbes Most Admired Companies. Quest had $7.5 billion in revenues in 2016. To learn more about Quest's 50th anniversary visit www.QuestDiagnostics.com/50Years. The Quest Diagnostics Charitable Foundation selected two of the recipients of the Health In Your Hands Grants. One of the winners, Autism Speaks, was selected by employee vote. The candidates were selected based on mission to improve health, national or global scale, and intended use of the grants to improve health or healthcare. The American Red Cross will use its Health In Your Hands Grant to support its blood donation and disaster relief programs. The National Ovarian Cancer Coalition will use the grant for its Faces of Hope program, which includes its TEAL Totes program to distribute resources to woman at diagnosis and NOCC CancerConnect online community for patients and caregivers to connect to share their stories and provide peer to peer support. Autism Speaks will use the grant to support researchers to explore the genetic underpinnings of autism and advancing toward better interventions. For more than 25 years, the National Ovarian Cancer Coalition has been committed to raising awareness, promoting education, and funding research in support of women, families, and communities touched by ovarian cancer. The NOCC is well established as an important national advocate for patients and families struggling with ovarian cancer, and remains steadfast in its mission to save lives by fighting tirelessly to prevent and cure ovarian cancer, and to improve the quality of life for survivors. For more information or to find a chapter near you, please visit http://www.ovarian.org, follow us @noccnational and join the conversation with #NOCC and #KnowOvarian. "When I founded MetPath in a New York apartment, it was my goal to ensure patients could have quality diagnostic services to ensure the best health outcomes possible," said Paul A. Brown, M.D., founder of MetPath, the predecessor business of Quest Diagnostics. "Today, Quest continues that legacy by providing laboratory services to one in three adult Americans and half the physicians and hospitals in the United States through its first-in class diagnostic services. It is marvelous to see the Quest organization evolve over the years to have such a tremendous positive impact on the world." "There is inherent social value in the work we do each day to empower better health outcomes," said Jeffrey S. Shuman, senior vice president and chief human resources officer, Quest Diagnostics. "We are excited to be able to engage all of our colleagues at Quest to mark our 50th anniversary in a positive and impactful way. By partnering with our employees and non-profit organizations with aligned interests, we can build meaningful value for our patients, our customers and the communities in which we work and live." "We are honored to be a Health In Your Hands Grant recipient and are grateful to Quest Diagnostics Charitable Foundation for their generous support of the lifesaving work of the American Red Cross in New Jersey, across the country and around the world," said Ana Montero, CEO, American Red Cross New Jersey Region. "We salute Quest Diagnostics on their 50th anniversary and are especially thankful to be a part of this milestone event." "On behalf of the women and families affected by ovarian cancer, it is with deep gratitude that we accept this generous donation from Quest Diagnostics," states David Barley, CEO of the National Ovarian Cancer Coalition. "Ovarian Cancer is the 5th leading cause of cancer-related death in women. These critical funds will help support the NOCC's local and national programs for earlier awareness, quality of life for survivors, and important research. 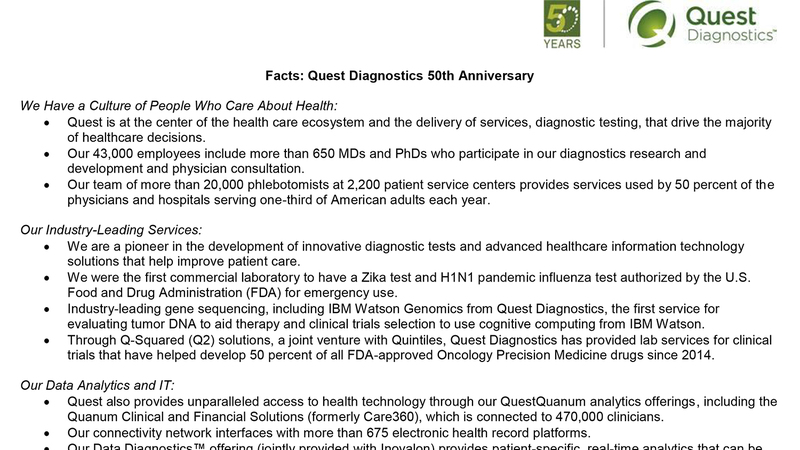 Congratulations to Quest Diagnostics for 50 years of service to the healthcare community." "We deeply appreciate the Health In Your Hands Grant, which will help fuel our mission to promote solutions across the spectrum and throughout the life span," said Mathew Pletcher, co-director of the Autism Speaks MSSNG genetic research program. "We applaud Quest Diagnostics on its 50th anniversary for its vision and for investing in the future of autism research."